The first public meeting was held on January 16 outlining the City’s plans to replace the concrete-arch bridge, connecting Greenfield Avenue with Schenley Park, with a steel arch. 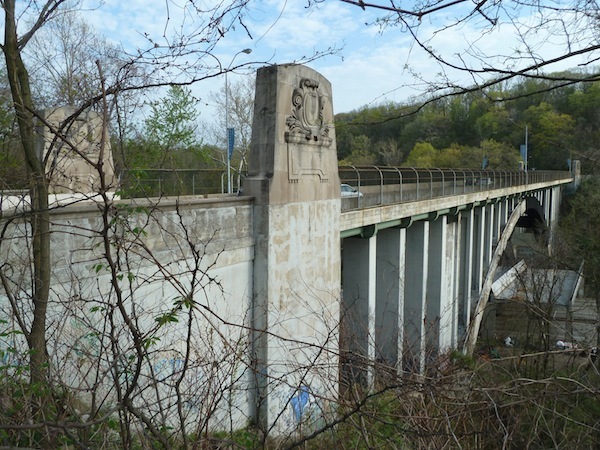 The Beechwood Boulevard Bridge, also called the Greenfield Bridge, was designed in 1921-23 by Charles M. Reppert, chief engineer, and Stanley L. Roush, architect. It was altered in 1980, and much of the decoration on the once-ornate bridge, including a grand series of sculpted lamp standards and urns, was removed. The City plans to keep and restore the entrance pylons and remaining parapets and urns alongside the abutments. Furthermore, the City is going to replicate the original parapets and urns across the new structure. To the people crossing the bridge on Beechwood Boulevard and Greenfield Road, the replacement bridge will look more historically accurate than the current structure (after its 1980 rehabilitation). In the 1910s and 1920s, seven ‘City Beautiful’ open-spandrel concrete arch bridges were constructed by the City of Pittsburgh: McArdle Roadway, Murray Avenue, Beechwood Boulevard, Baum Boulevard, Heth’s Run, Larimer Avenue, and Meadow Avenue. With the upcoming replacement of the Beechwood Boulevard Bridge and the Heth’s Run Bridge, only the Larimer Avenue Bridge and part of the Meadow Avenue Bridge will remain. (A new steel bridge was constructed on the Meadow Avenue Bridge’s original concrete arch ring).